The Brainwave Entrainment Audio contained herein will allow you to reach an altered state of consciousness in which you will commune with the great God of the Dead, Anubis. The Frequency used is High and Low Delta Waves. 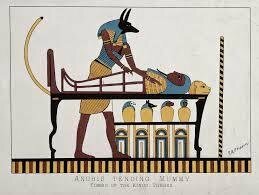 Anubis is the God of the dead, but also that of great mysteries. With this audio, you can commune with him and perhaps, he will bestow upon you the the secrets of the netherworld.